lovedog ranch: Happy Birthday Jasper! and J.May, the big 2! We will be celebrating the big day at the off-leash dog park. She's also bound to receive some dog cookies and a new toy because I am a shameless dog mom and can't help but spoil her. 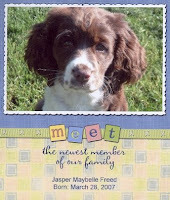 Thanks for joining our family, Jasper! Aw.... she thinks she's people! Jay, dogs are people too.